It is always fun when athletes play dress-up, because the idea of tens of men all wearing the same uniform is a kind of dress-up anyway. 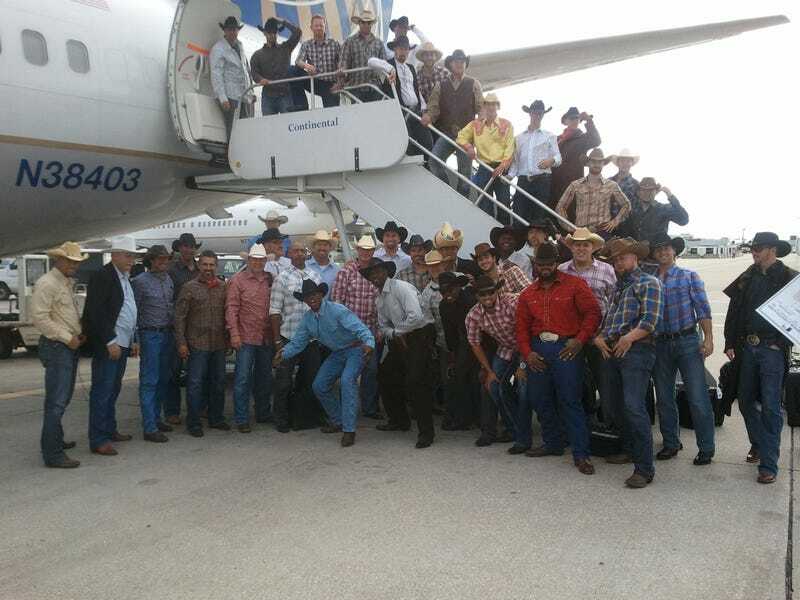 The Brewers shed their road grays for flannel on their recent trip to Houston. It was all at the suggestion of manager Ron Roenicke, who got the idea of theme road trips from Joe Maddon. On Friday, the entire team descended on a local Western store, and bought up scores of big hats, big boots, big belt buckles, and lots and lots of flannel. Do we even have to mention that Nyjer Morgan enjoyed this more than anyone else, or indeed more than a 5-year-old boy would have enjoyed it? He broke out the full Canadian Tuxedo and rechristened himself "Tony Tombstone." If you're not Texased out, check the official Texas Tech intro video, which debuted on the big screen on Saturday. It appears to take a couple shots at the "Hollywood" Longhorns, who may be the Red Raiders' Pac-16 rivals before long. The video has all the style of the Brewers, plus cows and guns and a very awkward Tommy Tuberville, who looks like the only person involved with this video who realized it would be shown to the public someday.